Welcome to Today In Mississippi! Today in Mississippi is published by the Electric Cooperatives of Mississippi for more than 465,000 members of 19 consumer-owned electric cooperatives in the state. The publication's content reflects electric cooperatives' pride in their home state and deep commitment to serving its people. 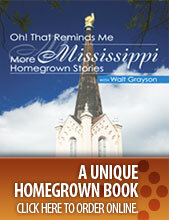 Today in Mississippi seeks to inform electric cooperative members while offering a unique mix of feature stories, columns, reader-participation features and recipes—all centered on life in Mississippi. We hope you will spend a few minutes with us here to discover what makes Today in Mississippi one of the most popular publications in the state. Deadline for photo submissions is June 12, 2019. Get details here.